In a previous article, you read about health insurance considerations for job seekers who’ve recently graduated from college. While it’s important for those starting out in the workforce to know their coverage options, those with years of experience who suddenly face cutbacks and layoffs can be just as overwhelmed. And, things can get even more complicated if there’s a family involved. If you’ve been laid off from your job and are looking for work, there are several options to make sure your family is protected from life’s emergencies. The Consolidated Omnibus Budget Reconciliation Act of 1985 provides short term coverage for qualified workers, their spouses, and their dependents after leaving their employer. The duration of coverage is determined by each state. The plan provided closely matches an individual’s or family’s existing coverage, but may be too expensive given the need for the individual to pay insurance premiums in addition of any co-payments. If you have any questions about COBRA, check with your former employer, or visit the Department of Labor. If COBRA isn’t a feasible option or your benefits are about to end, make sure you start looking for something else two months before the plan expires. Use a spouse or family member plan. This option may not be available to the majority of job seekers because most health insurance plans through employers can only add family members once a year during the open enrollment period. Some policies do offer exceptions in situations of marriage, birth, or a change in employment status. Check your family member’s employer insurance policy to see if being added would be a viable option. If it is, this may the preferred choice. Your trade association, or professional associations like the Public Relations Society of America, may offer health insurance. Some of the insurance offered through associations is comprehensive and some is limited, so be cautious in assessing these options. Again, start your research early and see what options are best for you. If you’re on a budget, consider a plan with a high deductible and lower premiums that will cover you for a major illness or accident. There are several places that can help you choose the best option. Check with your state’s insurance department to see which companies offer local health insurance. Another great place to start is to talk with your doctors or friends about which companies they like best. Insurance has been a hot topic of debate for the past few years. Finding coverage isn’t easy and can be very confusing and time consuming. But it is vital to your wellbeing and the health of your family to make sure they are covered from life’s unexpected accidents. Take the time to learn the ins and outs so you can stop worrying about health insurance and focus more on the job hunt. Graduating from college is a commendable achievement, but it can take some time to secure your first professional job. Many times the biggest fear and headache of being an unemployed college graduate isn’t making enough money. It’s health insurance. The hassle and confusion of finding heath care coverage can be overwhelming, especially when you’re fresh out of college looking for work in a still-struggling economy. But, there are alternatives for those just coming onto the job force. 1. Stay on your parents’/guardians’ coverage. Often the easiest and most popular option is to remain on parental or guardian coverage, especially since the passing of the Affordable Care Act of 2010, which allows dependants to remain under their parents' or guardians' insurance until age 26. But, for some that may not be an option. Restrictions and extensions of coverage vary by state, so make sure to check your state’s rules and regulations. 2. See what your school has to offer. 3. Find your own coverage. If you’ve graduated, or are getting ready to in December, and aren’t covered by your school or parents/guardians insurance, this may be your only option until you land a job. The most important step is to do your research. There are sites like Consumer Reports and HealthCare.gov that will take you through what coverage best fits you. Ask yourself how much freedom you want in being able to choose which doctors to see, if you need dental and vision coverage, and how much you’re willing to spend. After getting hired, there are often still several insurance issues to consider. Many companies that offer health insurance have a mandatory evaluation period before new employees qualify for benefits. Keep this in mind when planning your coverage even after getting hired. Talk with the HR representative of your new company to find the option that will work best for you. Finding coverage isn’t always easy, and can be very confusing and time consuming. But, it’s worth it in the long run to take the time to learn the ends and outs so you can spend more time focusing on finding that first job to start your career and less time worrying about your health insurance coverage. 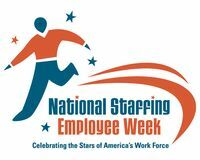 National Staffing Employee Week just began and with it comes a time of appreciation for the 2.5 million men and women who make up the temporary and contract workforce in the United States. Many may think that only a small percentage of U.S. workers are temporary or contract workers. However, according to the American Staffing Association (ASA), 9.7 million workers are hired by U.S. staffing firms during the course of a year. Being employed by a staffing company can provide flexibility that otherwise might not be available in an average full- or part-time position. It is reported by ASA that 88% of staffing employees said temporary or contract work made them more employable. And, 77% said it was a good way to obtain a full-time position. With this flexibility comes an alleviation of stress and an increase in career satisfaction that may not be possible in a traditional job. 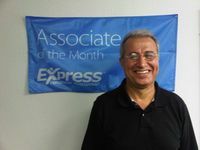 In honor of National Staffing Employee Week, Express holds a contest to select the Express Associate of the Year and to find a truly remarkable associate to nominate to ASA for the 2012 National Staffing Employee of the Year. These associates are selected from nominations submitted by our 550 locations and are chosen based on the staffing industry’s 5 key messages. So, whether you are employed by a staffing firm or considering pursuing a new career path, take this week as a moment to take pride in the integral part you play in not only furthering your career, but also building a stronger economy. We salute your hard work and dedication. Like it or not first impressions carry some weight in your hunt for a new job. Whether you are heading to a job fair, attending a networking event, or going to a job interview you’ll want to make sure your first impression sends the right message. When you’re networking or presenting work samples during an interview, chances are you’ll have a few belongings with you. While this is understandable, you don’t want to make it a nuisance. For example, if you’re at an association meeting make sure to have business cards in your shirt pocket or the outer pocket of a purse. You don’t want to have to dig through a backpack for them. In addition, try not to carry around a portfolio and a drink at a meeting, you won’t be able to shake hands or accept any handouts without awkwardly setting your other items down. Choose a simple glass or bottle of water at an interview over a cup of coffee that requires milk, cream, etc., it will help you stay focused on the meeting. Before you head out the door, take inventory of your belongings and see if you can leave anything behind that would reduce your personal clutter – remember less is more. Whether it’s heavy perfume or clothing scented with your favorite Thai restaurant, it’s best to be seen and not smelled. People can be sensitive to smells, and you wouldn’t want an interviewer distracted by your heavy cologne. Reduce scents by avoiding strong perfumes and scented lotions. Don’t eat at aromatic restaurants prior to meetings and make sure to combat bad breath after meals with mints or by brushing your teeth. Take note of the mood and environment of any event and match your responses appropriately. You may typically be fairly informal in conversations, but if you’re being introduced as “Mr. Smith,” make sure to address others using their surname. If you’re at a company meal and no one orders an alcoholic drink, mirror their response and save your cocktail for another night. First impressions aren’t a time to make bold impressions. If your interviewer voices a strong opinion on upcoming legislation, it’s okay to share your understanding of the changes but avoid debating the issue at a first meeting. While it’s important to connect with others, it’s best to play it safe. The shoes make the man, right? Well not quite, but having clean and appropriate footwear does help set the right first impression. It’s not the time to break out your killer heels. Make sure your work boots have been cleaned from excessive dirt and repaired of any wear and tear. You don’t have to have new or expensive shoes, but consider taking your dress shoes for a professional shoe polish. You’ll be amazed what a difference this can make. Of course you can polish them yourself, but you need to do this sooner rather than later. When you’re heading to an interview, the last thing you want is to be late because you are cleaning your shoes. Leave your baseball cap at home when you’re heading out to meet new people. Hats can make it hard for people to see your eyes, making conversation awkward. Also, fix your hair and avoid outrageous styles for first impressions. You don’t want people to remember your hair style, you want to be remembered for your thoughtful insights and engaging attitude. At the same time, make sure your hair is styled. Throwing it up in a ponytail may work for casual Friday, but when you want to look your best, put a little effort into fixing your hair. While it may not be fair to judge a book by its cover, when it comes to first impressions, the best rule is to not do anything too extreme. While a conversational piece of jewelry is okay, wearing a tiara to stand out is taking it too far. Bringing a portfolio to show off your work samples is fine, requesting an easel for a flip chart and overhead projector for your PowerPoint is overboard. The less you have to handle, the more you can focus on connecting with your new contacts. Deciding to relocate for work can be a very tough choice with many factors to consider. For some, choosing to pack up life and head for more opportunity could mean moving from a small town of several thousand people to a major metropolitan area with a population in the millions. Preparing for a new job is tough enough with new policies, procedures, and supervisors to consider. 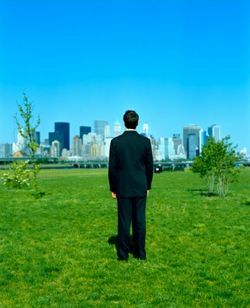 Adding in the stress and headache of relocating to a new city can make it all very overwhelming. There’s a strange paradox newcomers often feel when living in a major city. They are constantly surrounded by people, but can feel isolated and alone at the same time. People from a small town culture are inclined to have a more leisurely and open approach with each other. In larger cities, many are rushed with where they need to be and don’t have time for interruptions. Adjusting to the culture shock can take a long time, especially if you move to an area without family or friends. Here are some tips to help you cope with adapting to your brave new world. Don’t go into things blindly. Find a place to live before you move. If renting, some tenants in large cities need at least two weeks to process your information and ready the rooms before allowing someone to move in. Get settled in before you start your new job to help make the transition smoother. Calculate the cost of living, taxes, insurance, and other expenses before you make the leap, but also take time to look into the little things like parking, weather, public transportation options, laws, school systems, and population. Once you’ve decided on the area to live in, figure out how it works. Being prepared for the culture of your new area will make things go much smoother. Find out the distance between your home and the office so you know how long it will take you to get to work. It’s your city now, so get out there and meet it. Try to find a detailed map of your newcity and take some time to see it first hand. Make sure you’re aware of important things like local grocery stores, fire stations, hospitals, police departments, and banks that are closest to where you live. Also, take the extra step and introduce yourself to your neighbors. Many of them can have insights to the many perks the city has to offer. Exploring the city will also help you figure out the shortest and easiest routes to work, as well as find the busiest and longest routes to avoid, giving you the best commute possible. Just remember to add in extra time for morning traffic. And, don’t be afraid to get lost. Finding your way back will only help you familiarize yourself with the area. Making friends and acquaintances is one of the best ways to make the adjustment time shorter. That’s why it’s important to get involved with local clubs and organizations. It’s a lot easier to meet people outside of work if you get involved with something that happens regularly on a weekly or monthly basis. Whether you’re interested in sports or the arts, big cities will have a group getting together no matter what your interest may be. A good place to start is with your local chamber of commerce. Many chambers now have monthly professional gatherings. Go ahead and challenge yourself to try something new. There is a lot big cities offer that small towns just don’t have. There are several charities and organizations that need volunteers, so use your free time to serve the less fortunate and meet new and interesting people at the same time. Check with your company to see what community projects they’re involved in. Spending a Saturday building a house, helping out at a local shelter, or even running in a 5K that benefits a nonprofit is a great way to get to know your co-workers. Sometimes the hustle and bustle of city life can be too much. It’s OK to occasionally take a break from the concrete and skyscrapers, and search out some flowers and fields. Many big cities have suburbs with a smaller-town feel, beautiful outdoor scenery, and less crowds. So if you start to feel overwhelmed, spend a weekend or even just an evening out of town. If leaving the city is impossible, finding shops or stores that remind you of homecan help escape without leaving. Many coffee shops and cafés can provide a warm feeling of home when sitting inside their four walls, allowing you to relax and recharge for the next day at the job. There are also many places in the big city that can provide sanctuary to the rush of city life. Find a park and spend some free time there. Being in nature can help expand your horizon and help you recover from the stress of the cluttered city. Relocating may be a big decision, but there are several benefits to relocating for work. If the job is right and you’re in need of a good challenge, go ahead and take a chance on the big city. For those who have already relocated, what have you done to adjust to big city life? The debate against education and work experience has good arguments on both sides. When marketing yourself for jobs and advancing in your career, let us know what you find more valuable. What is more valuable in advancing in your career? With the fast pace of the work environment and the desire to succeed, stressful situations can come up between you and your peers. Whether it’s a misunderstanding regarding a deadline, a conflict over limited resources, or a debate over the direction of a project, a tense environment among co-workers can create roadblocks in the workplace. Here are a few tips for an open and relaxed environment that fosters conflict resolution. If you’re dealing with a co-worker conflict or know a subject might be touchy, skip email or phone conversations when possible in favor of a face-to-face conversation. A casual, impromptu conversation can set the stage for a relaxed discussion in which all parties are open to the idea of focusing on resolving the problem instead of focusing on their own agendas. If you must schedule a meeting to talk, versus just stopping by, make sure your email, phone message, or conversation regarding the scheduled meeting is clear and open. Don’t overstate the conflict, instead request a time to talk about resolving the challenge. The quicker you can meet the better, since leaving time to dwell on the upcoming meeting can create unnecessary anxiety. If you can’t have a face-to-face conversation, schedule a conference call where all involved parties can speak together, rather than separate calls with each individual. Having individual calls, and then later referencing each conversation, will not develop the same trust and open communication as a shared call. While you may only think there are two options in resolving a problem, either your own or the other party’s, talk with non-involved peers to get some perspective and brainstorm alternative answers. Keep in mind, a solution that isn’t from either party involved in the tense circumstances may be the best starting point for a resolution. Don’t get others involved just to gossip about the problem or recruit peers into seeing things your way. Have private and respectful conversations with the goal of seeing things from another point of view. Try researching how competitors are handling similar challenges to help you think of additional ideas. Speak with your mentor and ask for direction or how they have handled a similar problem. By keeping an open mind, you may uncover a way out that wasn’t on the table, and your first discussion may just be starting points to the best resolution. Rather than reacting quickly to a tense problem, if time allows, take a break. At first blush, a challenge can seem much worse than it actually is. We’ve all heard the saying “when one door closes a window opens,” and in the heat of the moment it can be hard to see the opportunities offered through that window. Another saying that holds true in conflict resolutions is “it’s best to sleep on it.” Letting emotions cool down and giving your brain time to focus on an answer rather than the frustration of the challenge can set the stage for a more relaxed resolution. Resist getting caught up in the heat of the moment. Keeping your cool, considering alternative solutions, and working toward a mutual answer will be the most productive resolution.